OML 61 is located onshore, south of OML 60. OML 61 covers an area of 1,499 km² (370,410 acres) and it is the largest License in OER’s portfolio in terms of both production and reserves. Exploration in OML 61 began with the discovery of the Ebocha oil and gas condensate field in 1965. Successful exploration continued in OML 61 with the discovery of the Obiafu-Obrikom (or Ob-Ob), Idu and Oshi fields in the early 1970’s. To date, the License comprises 12 producing fields. All of the producing fields in OML 61 contain both light and medium sweet oil (25° to 45° API), condensates and natural gas. 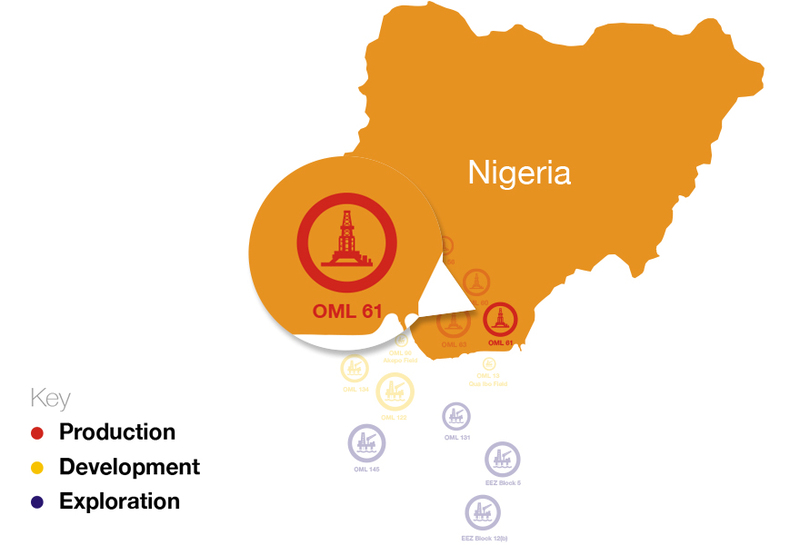 OML 61 also holds a rich portfolio of oil and gas prospects and leads mainly targeting the deeper underexplored reservoirs and step-out structures. Historically, oil has been the primary product, but many of the fields contain significant associated and non-associated gas reserves which are presently, and are expected to be in the future, significant contributors to gas sales. Production is primarily from the Ob-Ob, Idu, Oshi, Mbebe, Irri-Oleh-Isoko and Ebocha fields. Ob-Ob gas plant (capacity 1,000 MMscf/d).